Defenseman Mark Howe spent 10 seasons with the Flyers. 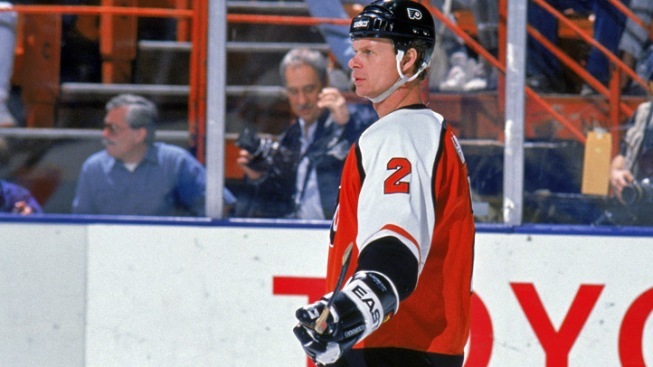 Longtime Flyers defenseman Mark Howe has long been a legend in Philly. Now he will be a legend in the Hall of Fame as well. Mark will be taking his spot in the Hockey Hall of Fame right next to his father Gordie. Unlike his father Gordie, Mark is not known for his physical play and flashiness but instead he is remembered for his steadiness, consistency, and mastery of his position over 22 seasons in the WHA and NHL. "His skill and grace, as well as his leadership ability, both on and off the ice, put him in a class by himself. The Flyers are proud to see one of our former players be inducted into the Hockey Hall of Fame," said Comcast-Spectacor President Peter Luukko. Howe played 10 seasons for the Flyers, appearing in 594 games from 1982 to1992. He remains the most prolific defenseman scorer in Flyers history with franchise records for career goals (138), assists (342) and points (480) by a defenseman. He ranks 14th overall on the Flyers All-Time List in scoring, eighth overall in assists, and fourth overall in shorthanded goals (24). "Mark Howe is the first Flyers defenseman to be inducted into the Hockey Hall of Fame, and rightfully so," said Comcast-Spectator Chairman and Flyers founder Ed Snider. With the Orange and Black Howe’s accomplishments include helping lead the team to two appearances in the Stanley Cup Finals. He won four Barry Ashbee trophies as the team’s best defenseman and the Bobby Clarke Trophy as team MVP in 1983. Arguably his best season in the NHL came during the Flyers Stanley Cup season of 1985-86 when he led the league at plus-85 while posting 82 points (24 goals and 58 assists). He was inducted into the Flyers Hall of Fame in 2001. He will be enshrined in Toronto on Nov. 14.